Standing in the field where the last of the Sept. 11 planes crashed, President Donald Trump praised the “band of brave patriots” who helped bring down the jetliner and saved the lives of countless others in the nation’s capital. Trump paid his respects Tuesday at a rural Pennsylvania field where the fourth airplane hijacked that day crashed after its 40 passengers and crew learned about attacks in New York and Washington and tried to storm the cockpit. Terrorists at the controls of Flight 93 planned to fly it into the U.S. Capitol, Trump said. But through the bravery and sacrifice of passengers and crew, he said, “the Forty” spared Washington from a devastating strike. “A piece of America’s heart is buried on these grounds, but in its place has grown a new resolve to live our lives with the same grace and courage as the heroes of Flight 93,” the president said, standing on a dais just yards from where the plane went down. “This field is now a monument to American defiance. 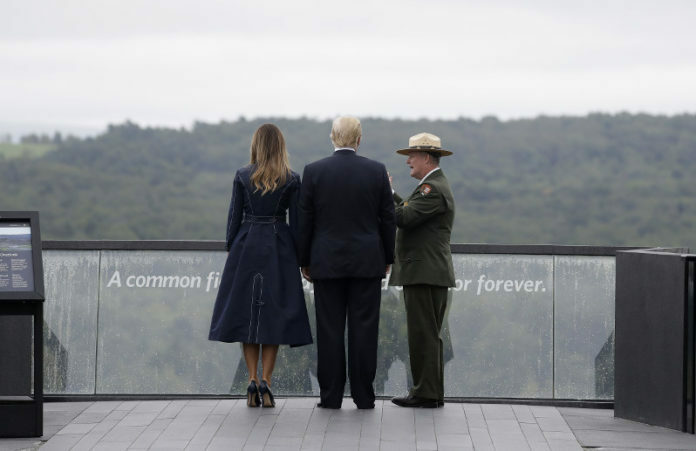 This memorial is now a message to the world: America will never, ever submit to tyranny,” Trump said as applause rang out from the audience of Flight 93 family members, dignitaries and others. Before he spoke, Trump listened as the names of the 40 victims were read aloud, followed by the tolling of bells. He was joined by his wife, first lady Melania Trump, Pennsylvania Gov. Tom Wolf and former Gov. Mark Schweiker, who was the state’s lieutenant governor on 9/11. Nearly 3,000 people died that day when other airplanes were flown into New York’s World Trade Center and the Pentagon in an attack planned by al-Qaida leader Osama bin Laden. Bin Laden was killed in May 2011 during a U.S. military operation ordered by President Barack Obama. In Shanksville, Trump spoke of the passengers who boarded the United Airlines 8 a.m. flight from Newark, New Jersey, expecting to get off in San Francisco. Before leaving Washington, Trump marked the anniversary with tweets, including praise for Rudy Giuliani, his personal attorney who was New York’s mayor on 9/11. Trump had been in his Trump Tower penthouse, 4 miles (6.5 kilometers) from the World Trade Center, during the 2001 attacks. He has a mixed history with Sept. 11, often using the terror strikes to praise the response of New Yorkers but also making unsubstantiated claims about what he did and saw that day. He has also accused fellow Republican George W. Bush, who was president, of failing to keep America safe. He has said, when talking about Muslims, that “thousands of people were cheering” in Jersey City, New Jersey, across the Hudson River from lower Manhattan, as the towers collapsed. There is no evidence of that in news stories at the time. Trump also has said he lost “hundreds of friends” in the New York attack. He has not provided names but has mentioned knowing a Roman Catholic priest who died while serving as a chaplain to the city’s fire department.